Uncontrolled fire is always a dangerous and scary scenario. Oklahoma had a difficult weekend August 3rd to the 5th, 2012 when a series of wild fires burned temporarily out of control in the central and eastern parts of the state. The Oklahoma City metro area was the scene of catastrophic losses for property owners. Local newspapers reported nearly 9,000 acres burned just east of Norman, and Slaughterville, Oklahoma, with 49 houses reported destroyed and one person dead. The weather on Wednesday, August 8th looked good and I decided to fly my Fisher Celebrity over the burn areas to get a better sense of what had happened. It turned out to be a sobering flight. I got to the airport about 6:45 am, fueled the Fisher, did my preflight check, and was ready to go by 7:20. 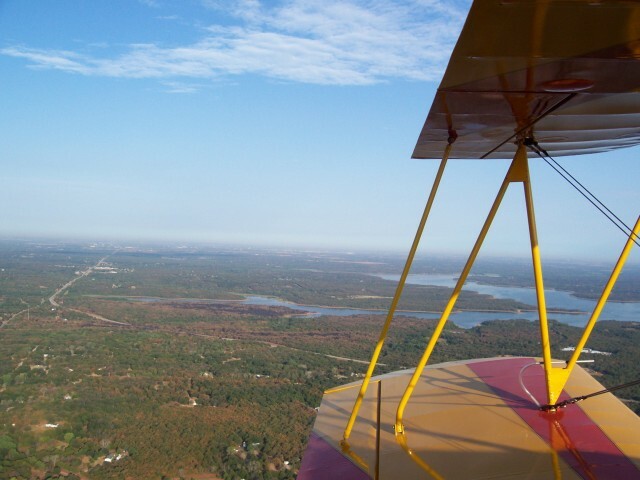 The wind was calm and I was able to take off on Runway 35 where a 45 degree turnout to the northeast would put me in the general direction of the fires. I turned another 15 degrees to the east to avoid flying too close to the pattern of our neighboring airport, David J. Perry. 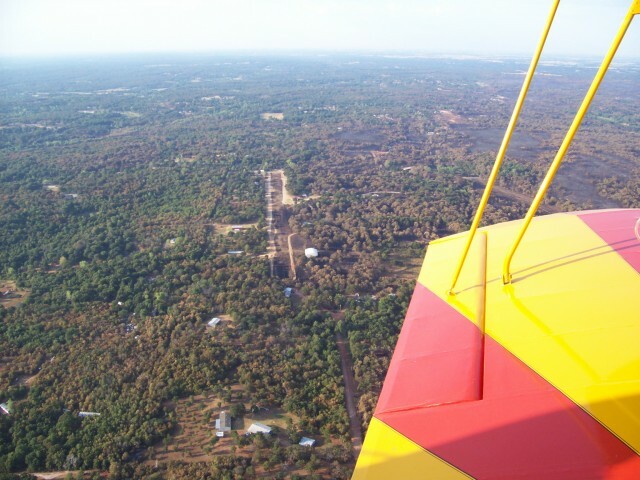 A view of runways 13/31 at David J. Perry airport, northeast of Paradise Air Haven, center of photo. 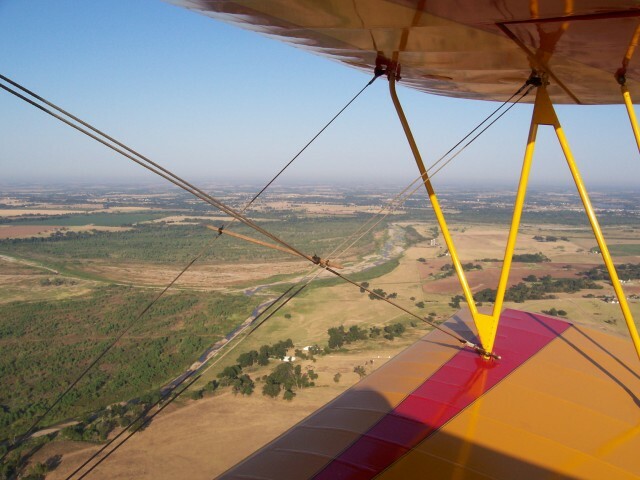 There was not a lot of traffic on I-35 as I flew over it and held to my heading of 90 degrees while climbing to approximately 1,000 feet AGL. I-35 looking to the south. 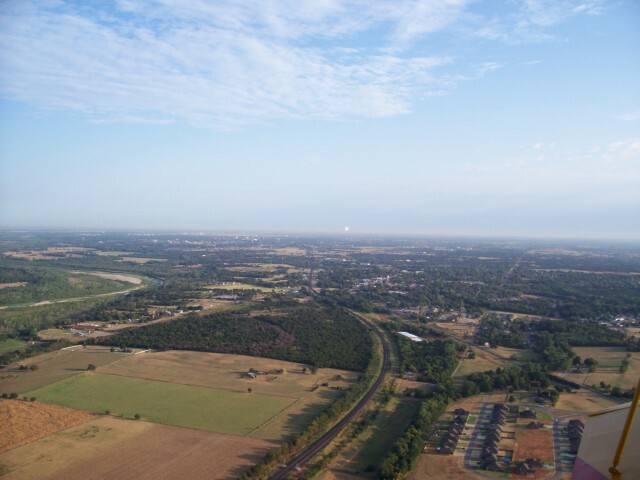 After crossing the interstate, a look to the left gives a view of the South Canadian River in the left center of the next photo, the town of Noble, Oklahoma, immediately below, and Oklahoma City in the distant center. The white point to the right of center is, I believe, the sun reflecting off the recently constructed Devon Energy Corporation Tower in downtown Oklahoma City. The sky was hazy this morning and visibility not as good as usual for early morning. 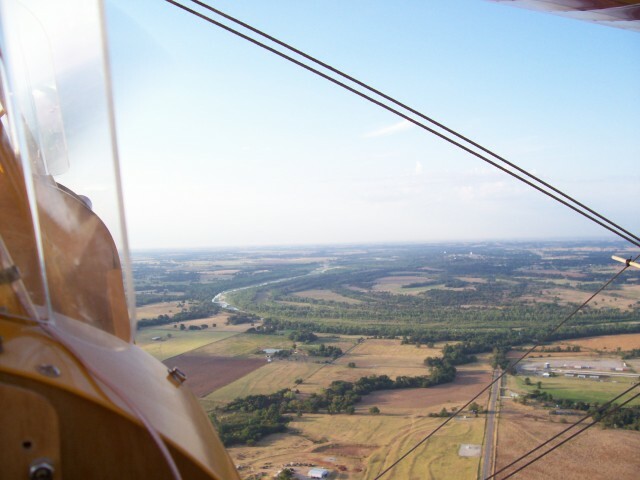 To the right was the South Canadian River as it flows southward between Lexington, and Purcell, Oklahoma. The South Canadian River flows between the towns of Lexington, and Purcell, Oklahoma just to the south of here. 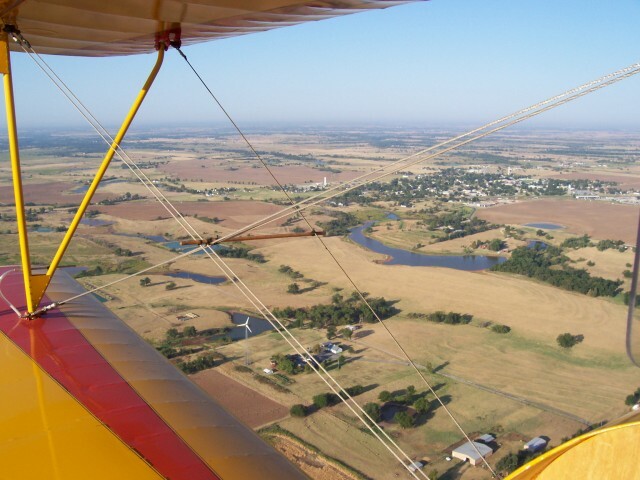 Just off my left wing is the small town of Slaughterville, Oklahoma, and McCaslin Field. 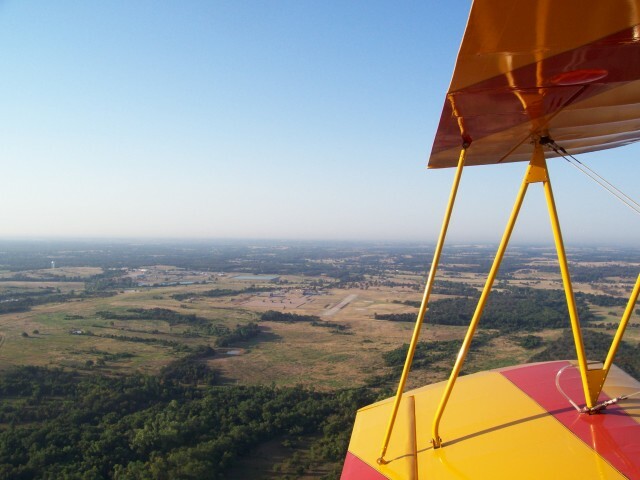 McCaslin is a small, single grass strip, privately owned airport open to public use. It has no fuel, no services, and only four airplanes based there. It, however, does provide a great, relatively air-traffic-free practice field for landing on grass. If you don’t know where to look it is difficult to locate from the air. The south end of the runway is right at the middle of my aileron push rod and on the ground where the road turns to the west. About another 3 miles to the east the burn areas begin. I flew another additional mile east and turned north to get the sun on my right side. The hazy air and sunlight were not a good combination for photos. Once on the northward leg, the contrast between burned areas and normal vegetation was more discernible. The burned area has a rust color from the air. 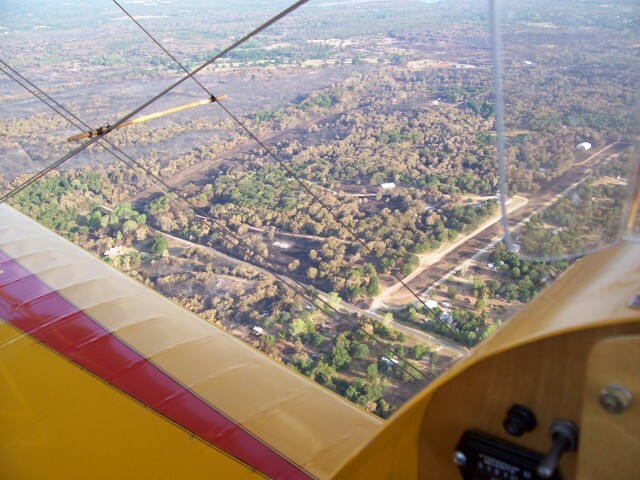 The unburned trees are still green and the unburned grass areas tan or straw colored. The vegetation in this area is scrub oak with grasses and other plants growing between the trees. Once a fire starts in this ground cover it burns rapidly and very hot. 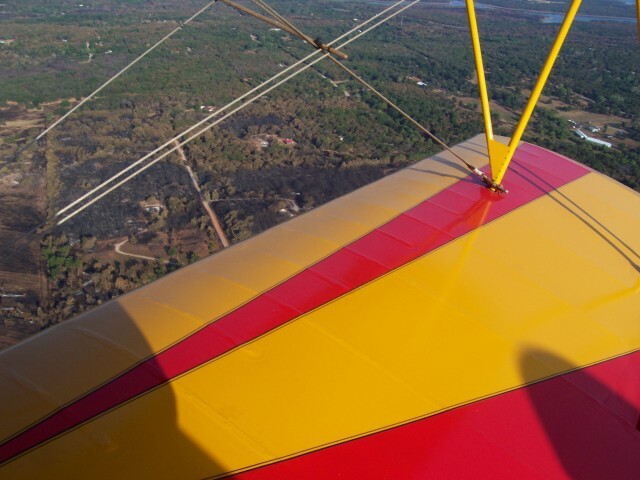 Fanned by southwesterly winds, the fires burned to the east-northeast from about 3 miles east of Slaughterville and Norman to the shore of Lake Thunderbird, a distance that I estimate to be in excess of 10 miles. The lake can be seen in the top center of the next photo. Smoke from a still smoldering fire can be seen right center of the photo along with an anomaly of a small green, unburned patch of trees just below and slightly to the right of the smoke. I don’t know what kept that and other areas from burning while surround vegetation suffered near total destruction. In the lower center of the next photo is a white rectangle in the center of a burned area. This, I believe was a mobile home that was probably destroyed. 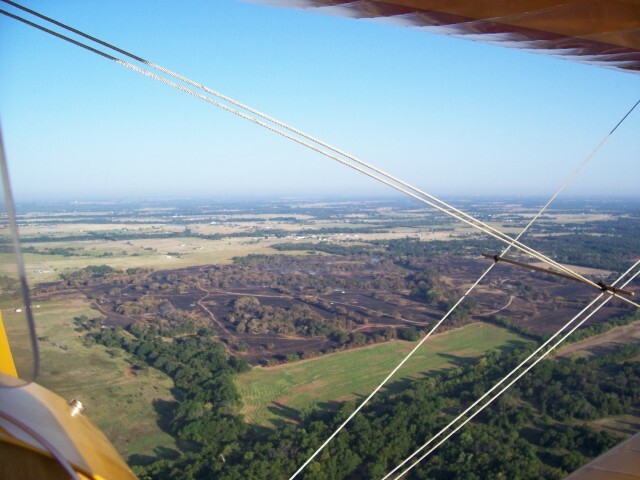 Interesting, this badly burned area is immediately to the west of Hickory Hills (10ok), a private airstrip that is visible right center of the picture. There is a road running around the south end of the strip and the grass of the strip is the black area between the two roads. Another photo of Hickory Hills taken from the north and a little higher shows the limits of the burn around it. The airport listing reports only one airplane based there. I have flown over this airport many times, but never landed there. It appears to have about four or five buildings (hangars?) on its perimeters. The northward limits of the fire ran up to the short of Lake Thunderbird. 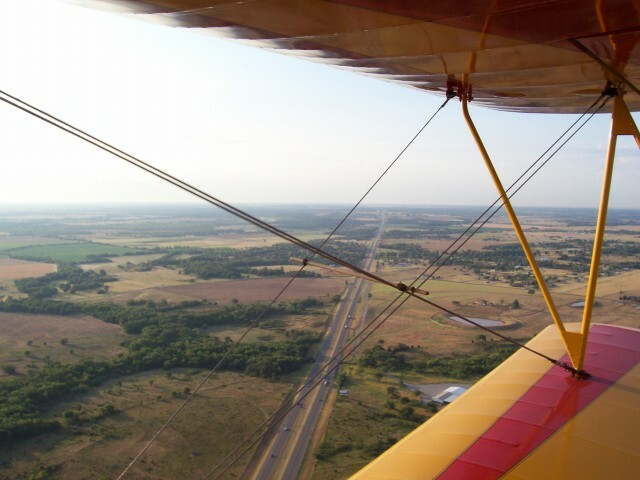 This area is part of Norman and the highway that turns to the west is Oklahoma highway 9 that runs along the southern part of Norman. Many buildings that appear to be surrounded by burned out timber presumably were damaged or destroyed by the fire. This area suffered intense fire with little left standing. If one looks closely there are four or five helicopters on the ramp to the left of the center of the runway. After crossing state highway 39 south of the heliport I turned to the east and flew by its neighbor the Joseph Harp Correctional Center, a medium security prison. Okay to visit perhaps, but not a place most people want to live! As I again turned and flew north of the prison and heliport, I noticed a smaller, isolated burn area to the northwest and flew over to investigate. This area was not part of the burn further north, but it looked like the fires were severe here. There appears to be a complex of buildings in the center that look like they were badly damaged. I again turned south and took this picture of the South Canadian as it makes a sharp bend to the southeast. Not much water in the Canadian this time of year. 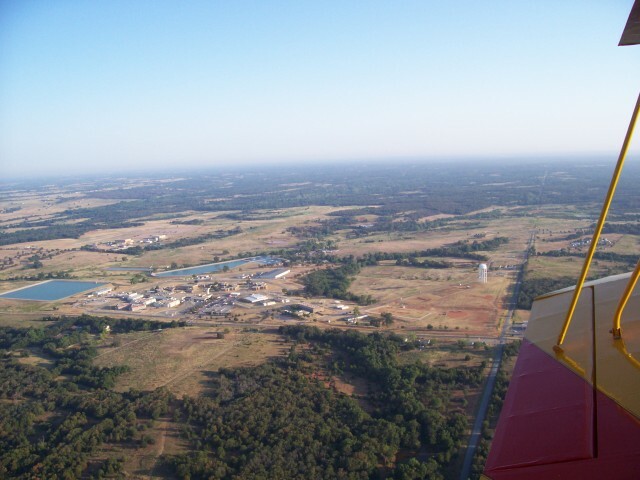 About five miles south of the river is the town of Wayne, Oklahoma. This is a photo of Wayne looking to the southwest. Just under my flying wires, left center, there is a private windmill that probably generates electricity for the nearby farm house. 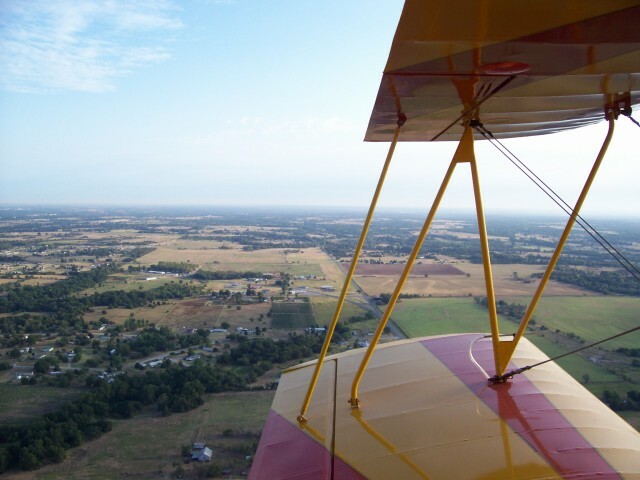 After passing Wayne to the west, I headed for home base, Paradise Air Haven, just south of Goldsby. 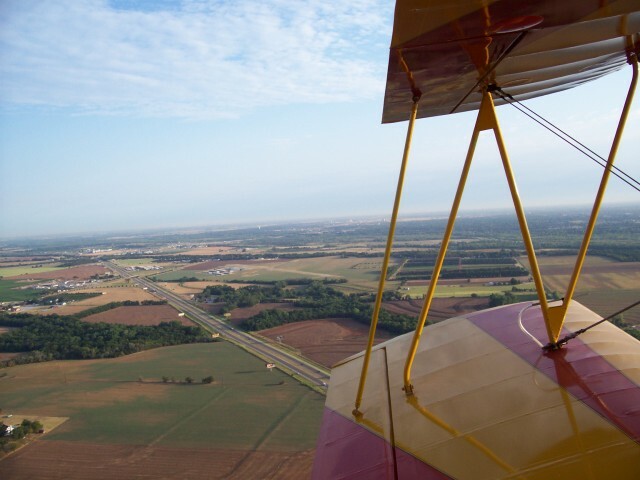 When I return from the south, I frequently fly up the Canadian River between Lexington and Purcell as far as the drag strip southeast of Slaughterville, and then turn west for Paradise. I put the Fisher in the hangar and went home with a perspective of the wildfires that only an aerial view could provide. 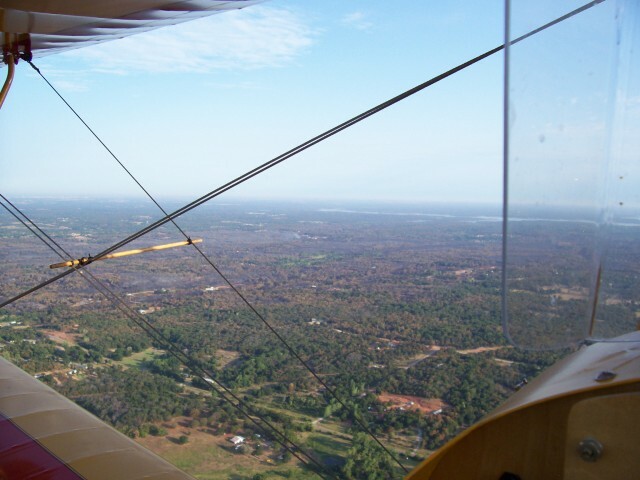 I got home thankful that my family was spared the damage and danger of the fires, and, as always, very grateful that I have the resources to own and fly an airplane. The flight over the burn areas was depressing when I stopped to think about the losses of homes and possessions that so many people suffered. 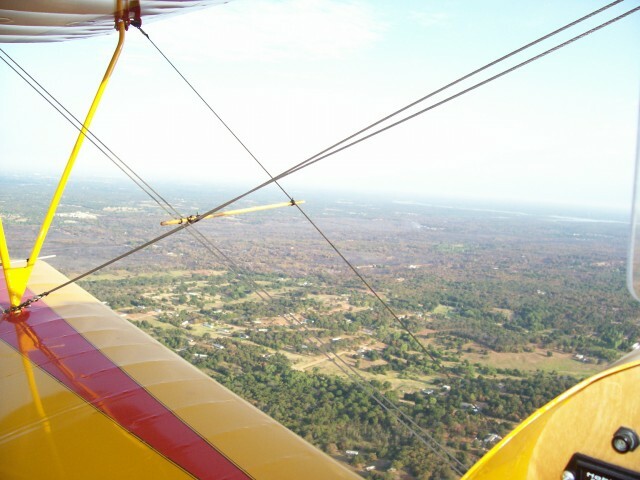 Flying over the area, sad as it was, could not compare to the emotions felt by those who were in the paths of the fires. It must have been a fearful time for families who had to evacuate and leave their homes and especially crushing to return and find them in ashes. 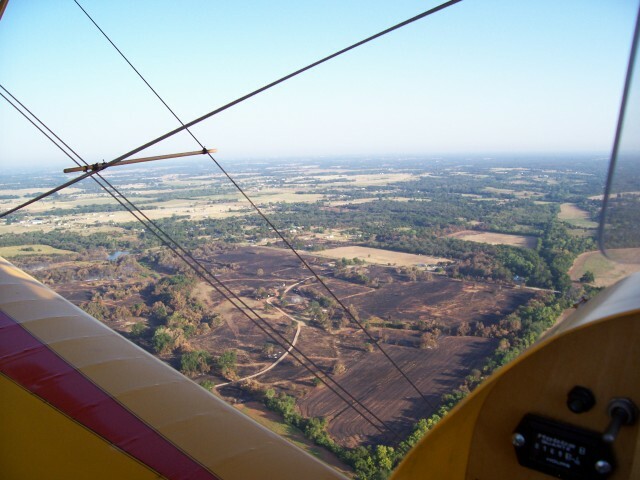 There were equally devastating fires northeast of Oklahoma City. The little town of Luther was badly damaged and fires in the Tulsa area were also very severe. To make the losses seem even worse, a week after their start, the State Fire Marshal has determined that the Norman and Slaughterville fires were acts of arson with no suspects to date. We had been hearing about the fires up here in Kansas but now I see how bad they were. When you found the separate burn North of the prison I suspected arson. My suspicions were confirmed by the Fire Marshal’s report. A buddy of mine is a Chaplain with Franklin Graham’s Disaster Response group. He may be heading down there this week.